Joseph Mallozzi's Weblog: November 4, 2009: The January Book of the Month Club Selection! November 4, 2009: The January Book of the Month Club Selection! The last time I flew to Montreal, I was seated beside a guy reading a science fiction novel. The cover caught my eye and I made a mental note to check out the author the next time I found myself in a bookstore. A little over a week later, I was on a flight back to Vancouver when I happened to glance across the aisle and notice a woman reading an SF title – different book, but same author. What were the chances? THIS, I decided, was fate – just like that time I got Autumn in New York as the in-flight movie in back to back trips which made me realize I was destined to re-marry Winona Ryder. Or vacation in New York. Anyway, I made a second mental note to remember my first mental note to check out the author the next time I found myself in a bookstore. Fastforward several months to last week when I received a package in the mail. Elated, I tore it open to discover, not the expected return correspondence from Winona, but a little something from my buddy, editor Lou Anders, over at PYR. It was the latest book by THE SAME AUTHOR! Seriously, what are the chances? From the publisher: “Boss loves to dive historical ships, derelict spacecraft found adrift in the blackness between the stars. Sometimes she salvages for money, but mostly she’s an active historian. She wants to know about the past–to experience it firsthand. Once she’s dived the ship, she’ll either leave it for others to find or file a claim so that she can bring tourists to dive it as well. It’s a good life for a tough loner, with more interest in artifacts than people. Then one day, Boss finds the claim of a lifetime: an enormous spacecraft, incredibly old, and apparently Earth-made. It’s impossible for something so old, built in the days before Faster Than Light travel, to have journeyed this far from Earth. It shouldn’t be here. It can’t be here. And yet, it is. Boss’s curiosity is up, and she’s determined to investigate. She hires a group of divers to explore the wreck with her, the best team she can assemble. But some secrets are best kept hidden, and the past won t give up its treasures without exacting a price in blood. 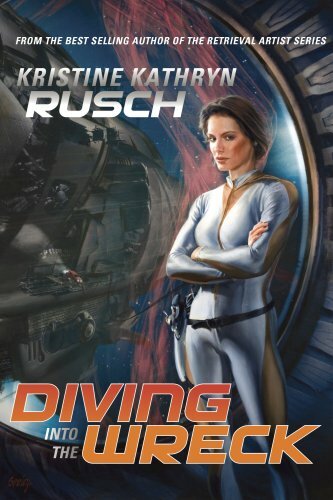 It’s an intriguing synopsis, the reviews are great, you have plenty of time to read the book, AND, to top it off, the author also happens to be a Stargate fan. So, when the time comes, in addition to asking her about the novel and whether or not she can introduce us to Winona Ryder, you can also get her SF expert take on things SG-1, Atlantis and/or Universe. Discussion the week of January 11, 2010 – with author Kristine Kathryn Rusch. A gentle reminder (please, don’t make me resort to a not-so-gentle reminder that will involve my taking a hickory switch to your bare calf) to finish up this month’s BOTMC pick, Emissaries from the Dead, by Adam-Troy Castro, as it will be up for discussion next week. Also, remember to pick up December BOTMC selection, The Misenchanted Sword, by Lawrence Watt-Evans, well in advance of its discussion on the week of December 8th. On the SGU front: a third day down and another story broken. We are zipping along! I figure that at this rate, we should have season 2 and most of season 3 broken by the time I’m Tokyo-bound. Tune in tomorrow for my thoughts on the stretch-run to the mid-season break. Today’s entry is dedicated to Arctic Goddess. Previous Article November 3, 2009: Creating the Crevasse! Production Update! And In Case You Missed It! Next Article November 5, 2009: Looking Ahead to the Stretch Run! AG…..sorry to hear about Tigger. See you in LA. I too am sorry to hear about Tigger! I too love cats and hope your heart heals somewhat soon! Did your son make it home in time to say good bye to him? I hope so! Ship diving… that’s an interesting side of SF I hadn’t considered. Nifty. Anyone can play, lurkers and newbies welcome!. Just copy this post to your post, then add your namelocation. Will we make 100 by next week? 300 in two weeks? Maybe even 500 individual names & locations?? Sadly the book wasn’t available via amazon kindle (yay for the iPod version! ), but I was able to get it through interlibrary loan. Hopefully I’ll be there to comment in January. Sorry to hear about Tigger. Brings back sad memories of our departed dog. @Arctic Goddess: I’m so sorry. Whoa there… wait until y’all get feedback from Season 1 before you go finalizing season 2!!! You might need to think of a way to bring back a character you decide to kill! Sweet dedication. Pets quickly become members of the family. When my son was young, he had gerbils that he named after characters in my book. But we had Pedee the cat who loved to just sit and watch the gerbils. They were safely tucked inside a covered fish tank. Pretty much cat proof. I heard crying upstairs one day and went to Chris’ room. There he was pointing at a very guilty looking Pedee and saying “We don’t eat family members!” Pedee had successfully pushed the tank to the floor and the gerbils went scurrying. One obviously not so fast. It was Tuk. Chris loved Tuk and Pedee. But his sweet lecture in trying to teach a cat…warmed my heart and I knew that Chris would grow up to be a good man. P.S. Sorry for the story, you inspired me. I left a big reply with my thoughts on your thoughts for yesterday’s blog and it hasn’t appeared! Don’t you love my thoughts? So… dumb question: You are discussing breaking stories for season two, and just mentioned season three. As I am assuming you have not yet been renewed for number two, much less number three, are you just that excited to break new stories? I guess my question is what do showrunners do when they/you are not… you know… running a show? Sound like a interesting book you chosen this time, will have to see if I can fine it at the local Library or buy it online. I also would just like to lend my support for little famous rant at fans who insult the characters or actors on SGU, I 100% agree with what you said. Good day to you Joe, thanks for the videos on how they did it behind the scenes, always fun to see. Wondered about it, just thought it was magic or osmosis. How is Maximus? Do the other pups leave him alone to recoup? Enjoy your day!! @articgoddess, sorry to hear about your kitty, it is never easy and they will always be with you. Winona Ryder? Who do you think you are, mister? Johnny Depp? Hey, maybe your destined to re-marry Lou Anders! Have a beautiful day, sir! @ Artic Goddess, my condolences. It’s a cruel twist of fate that our favored companions can only be with us a fraction of our lifetimes. It’s worse when you have to make the horrible decision to end their suffering. Newest household member had her first visit to the vet today, and has a staple to serve as a temporary souvenier. At least no more worries about hordes of squirming puppies in the future. Never knew a dog could look so miserable and make me feel so guilty before. She got her revenge during the night by leaving me sleeping in an awkward position, as I was unwilling to force her to move. Thanks for the early heads up on the BotM club and good luck on the season two work. Kristine Kathryn Rusch is an excellent writer and editor, and has been blogging about surviving as a freelancer at http://www.kriswrites.com. I encourage all to check it out, as it’s a fascinating look at the life of a writer. @Arctic Goddess My thoughts are with you. Ooh, that book sounds good. Of course, my libraries don’t have it and another round of passed levies means an affordable Netflix for books won’t happen this year. I’ll send them a note to pick it up, but I may just get desperate enough to buy it. I could afford it if I slash the vitamins from the budget and let my kids eat more vegetables, but then they might get spoiled and think they get fresh food every month. Maybe Stranger in a Strange Land will keep me occupied until a library gets it. Joe – the BOTMC selection for January sounds fantastic. Looking forward to reading it. PBMom – Your post yesterday was sobering. You can’t defend yourself against people who can attack anonymously. So, I don’t see how they won given that underhanded advantage. I post semi-anonymously for reasons of protection – like many people do. But discussing politics openly in the US these days is a tough thing to do. You can leave yourself wide open to all sorts of stuff. I think you were incredibly brave to do it. Most people don’t have the ‘nads for that and it’s admirable that you do. maggiemayday – go to Vancouver and check out the art scene and/or bars. Follow Joe’s culinary adventures if you can afford to. Victoria is very beautiful but it ain’t no Burning Man. My libraries do have it. I was using Rusch as a title search. Since it’s larger in the text treatment on the cover, I thought that was the title.